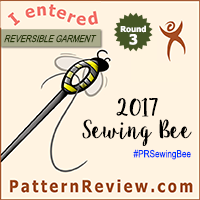 I was super excited about this round when it was first announced as I love reversible garments. My first thought was to make something with a wrap feature like a skirt, top or even pants. Then I remembered that I’ve been wanting to sew myself African cotton bomber since last fall and never got around to it. I LOVE bomber jackets! The options are limitless from fabrics (African wax, leather, velvet, satin, leather, denim), to style (letterman, military, feminine, patched), to colors (solid, color blocked, camouflage or animal print) and I want them all. Since no one person really needs a bomber jacket for every day of the week making a reversible one made perfect sense to me for this challenge. One side was a no brainer, I was definitely using this Angola print cotton I had in my stash. But what about the other side? First, I had to decide on the type of fabric. I considered velvet, a quilted ponte, and leather, but ultimately I decided on satin to have a more classic side to contrast the bold side. Next up color, I knew I wanted it to coordinate with the Angola side so I considered red, black, red & black and red & white before selecting black & white to really give it the classic varsity look. Still more decisions, which pattern? I’ve used McCalls 7100 before but I preferred a single piece front of Simplicity 8418 mainly because I didn’t want to break up the already busy Angola print. The split sleeve was a bonus which allowed me to add the piping detail to the sleeve. The pattern itself was straight forward. I didn’t follow the instructions step by step but I did read over them and they were clear. The only place I did revisit the instructions was for the piping as this was my first time installing it. Thankfully it was very similar to inserting an invisible zipper. I simply basted the piping to right side of the sleeve using my zipper foot and then sandwich the piping the right sides of both sleeve pieces before sewing again using the zipper foot. Voila! I debated adding a patch to the satin side and had almost decided against it, but when I spotted this rose embroidery patch (in TJMaxx of all places) I grabbed it. In the end I’m glad I added it. I’ve also never attached an embroidered applique but after testing the placement in the mirror (using double sided tape) I simply followed the instructions which worked…until it was time to turn the burrito of a jacket to the right side. Somehow I managed to peel up a leaf of the patch while I was turning it right side out, so I decided to hand stitch for security. One last thing I’m ecstatic about, the cool reversible ribbing I lucked up on at my local fabric store. I decided to use the black side against the white sleeves of the satin side and the white side for the neckline and waistband to contrast the main body. I highly recommend S8418, especially if you want to make a reversible jacket. Since the pattern includes a lining very little modifications are needed. Simply use a fashion fabric instead of a lining fabric and use a reversible or two headed separating zipper and that’s it! I chose to make two other changes. The first was simply adding pockets to the “lining”. The second was avoiding the hand stitching, which I accomplished by leaving my openings for turning at the zipper edges instead of the side lining seam. This was when you topstitch along the zipper you close those holes. I’m really pleased with my final product. I succeeded in making a bomber jacket that has a funky color side and a classic varsity side I see myself wearing this all fall. Pattern Description: Semi-fitted, raglan split sleeve, lined bomber jacket with optional flower applique. Were the instructions easy to follow? I didn’t follow them closely, but I did read them and they were clear. What did you particularly like or dislike about the pattern? I love everything about this pattern, though the side seam pockets are a tad difficult to reach. Fabric Used: Ankara cotton for one side and satin for the other. Pattern alterations or any design changes you made: I made it reversible by using fashion fabric for the lining and installing a reversible zipper. Would you sew it again? Would you recommend it to others? Yes I still want a velvet or denim version and yes! Conclusion: Great jacket pattern with unlimited options!